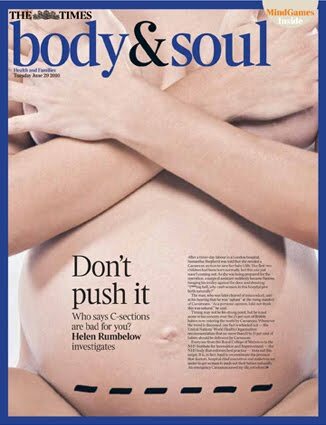 An article entitled Don’t Push It, Who Says C-sections are Bad For You? by Helen Rumbelow, appeared recently in the Times of London. Rumbelow explores the genesis of the World Health Organization “optimum” C-section rate of less than 15% and finds that there is no scientific evidence to support it. No one apart from the World Health Organisation has dared to put a target on the safe level of Caesareans — that’s why everyone uses its statistic. So where is the evidence that halving our C-section rate would be safe? Answer: there isn’t any. I tracked down the man who set the target, Marsden Wagner, a retired American paediatrician who was for 15 years the director of women’s and children’s health at the World Health Organisation. Many of the obstetricians that I spoke to said that the 15 per cent statistic “was plucked out of the air”. Wagner denied this, saying that his team looked at the best data available. Yet Wagner could not provide any such data for Ms. Rumbelow. That’s not surprising since Wagner himself has acknowledged that no data existed at the time the recommendation was issued. As I discussed in my post What’s the right C-section rate? Higher than you think. , Wagner noted that his paper Rates of caesarean section: analysis of global, regional and national estimates (Paediatric and Perinatal Epidemiology, 2007; 21:98–113) is the first to compare international C-section rates with maternal and neonatal mortality. It is Wagner’s paper, in fact, that I referenced in my quote above. He found that only two countries in the world, Croatia and Kuwait had C-section rates less than 15% and low maternal and neonatal mortality. Indeed, the average C-section rate for countries with low maternal and neonatal mortality is 22%, although rates as high as 32% or higher are consistent with low rates of maternal and neonatal mortality. Yet Wagner offers no such “international data”, not surprising, since there isn’t any. My niece had a c-section and now has a lot of scar tissue. She’s pregnant again and is high risk. She may not be able to carry another baby to term. We’ll see.